No matter what your situation or background, as parents there may be times when we need support. 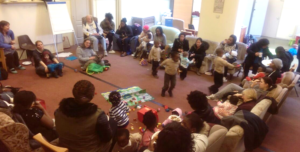 We Are Family is a place for parents to bring their children, where they can have fun in a relaxed environment, spend some time talking with other parents, learn new parenting skills and gain confidence. Refreshments and a crèche are provided, and there are group outings in the summer. We Are Family also provides support outside of the group hours as individual needs arise. For more information please visit the We Are Family website by following this link.